Escape to the enchanted forest in a land far, far away from where little elves, pixies and magical creatures roam. Tall trees, pastel flowers, mini toadstool houses and fairy dust covered skies are what we imagine there to be deep down in the enchanted forest. 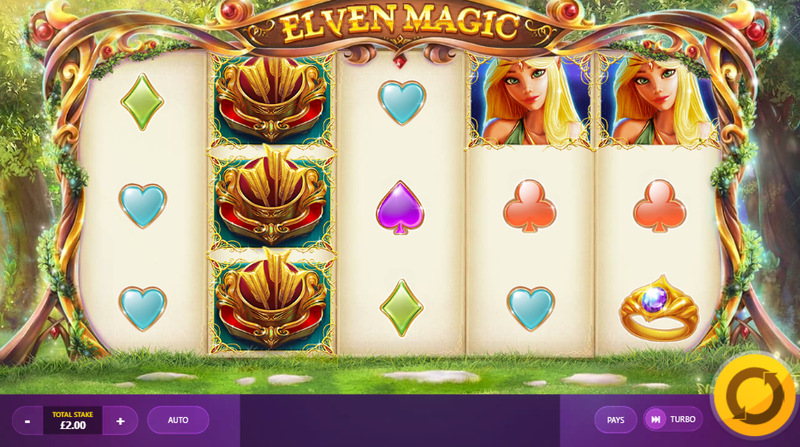 Elven is a fairytale-themed slot with 5 reels and 20 paylines. 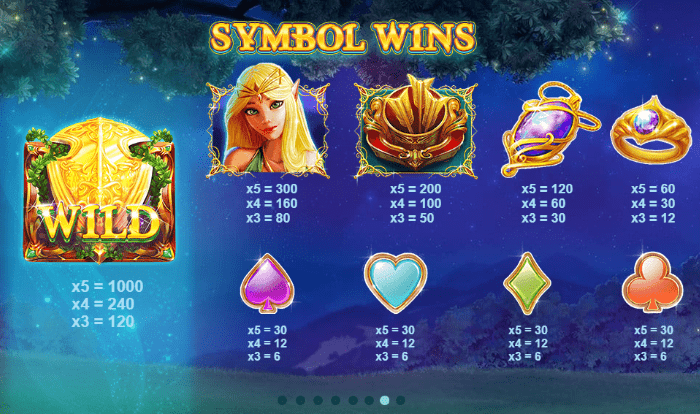 If you love magical adventures, then you will adore this slot. The design is pretty and whimsical and the features are exciting. Features include an archery bonus, wind arrow, nature arrow, ice arrow and a fire arrow. Grab your bow and arrow, it's time to hit that bullseye jackpot on this riveting UK online slot. Elven Magic is a fantasy-themed 5 reel, 20 payline slot. The setting is a beautiful enchanted forest filled with sweet green meadows with tiny stepping stones, tall magical trees and golden twinkling light where lots of magical creatures like elves, fairies, goblins and leprechauns live. On the left side of the screen, you'll see a long blonde haired elf with a crossbow and arrow ready to hit the reel and hopefully hit the bullseye jackpot. The symbols include pastel coloured playing card suits, a gemstone necklace, arrows, a golden ring, the bullseye bonus, and the elven queen. Are you up for a challenge to play best slots in the UK? Archery Bonus - The elf on the left side of the screen will shoot her arrows onto the reel. She can win up to a 1000x multiplier. To play the archery bonus, simply click shoot and fire your arrow at the target. Wind Arrow - The elf will fire arrows of wind onto the reels in this feature. The reels will start to spin like a whirlwind and will create some big wins. Nature Arrow - The elven queen will randomly turn symbols into wilds. Ice Arrow - In this feature, the top paying symbols and wilds can become frozen. A respin is also given here. Fire Arrow - Fire arrows will be shot at the reel causing symbols to be burnt into flames and replaced with new symbols. If you enjoy fantasy-themed slots then you will adore Elven Magic. Everything from the design, to the music and features are all magical. The archery bonus can award up to a fantastical 1000x multiplier and the arrows can also create many big wins. This slot developed by Red Tiger Gaming is super fun to play so why not give it a go or if your'e feeling particularly renaissance try Da Vinci's Treasure!